By the time Android 5.0 “Lollipop” officially arrives for the world to use with the Nexus 9 on November 3, I would imagine that Google will flip the switch on a number of massive updates to its core Google apps. We are talking design overhauls of Gmail, Maps, Drive, and Google Play Music with Material Design. But, since we know that many of you would rather not have to wait another couple of weeks to see what’s in store, we thought we should point out that a number of the new re-made apps have surfaced through a leak that has been incorporated into a Nexus 4 ROM. 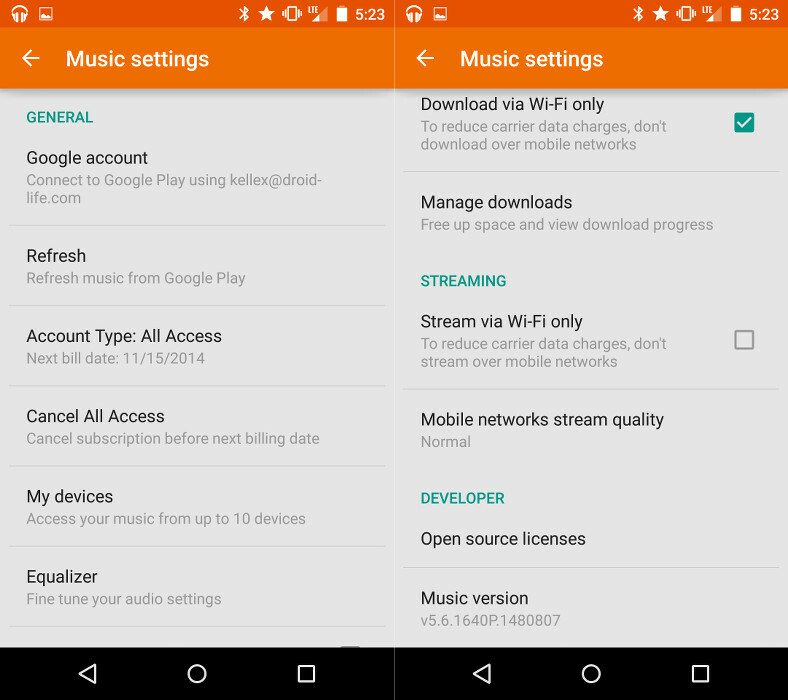 That’s right, someone leaked a ROM from the Nexus 6, which included all of the refreshed Google apps, like Play Music. 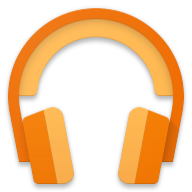 So yeah, this is what Google Play Music 5.6.1640 looks like. How pretty is this? The update will refresh the entire look of the app, incorporating the Material Design guidelines that were introduced back at Google I/O and then updated last week with the announcement of Android 5.0. 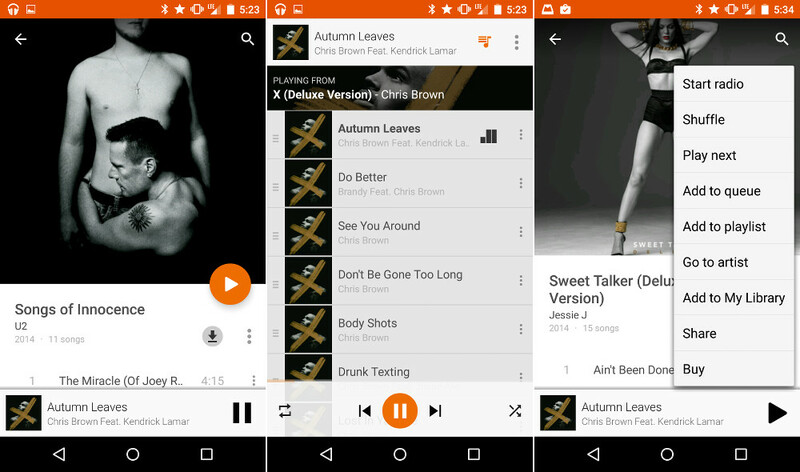 Buttons float (including a big “Play” button on album and playlist pages), album art is huge, the status bar is now pulling in the orange from the app, and there are beautiful animations everywhere. While we wouldn’t necessarily recommend that you install this app, or any of the others we will try to show you throughout the day, just know that they are out there. We pulled them from this Nexus 4 ROM over at XDA. I’m saying that you may not want to install these, because the signatures of the .apk files are conflicting with currently installed versions of the same apps (“An existing package by the same name with a conflicting signature is already installed.”). That could mean that whoever leaked these needed to repackage the apps and re-sign them to protect their source, which would then mean that they may be less secure. Proceed with caution, please. Edit: Tweaked title a bit. 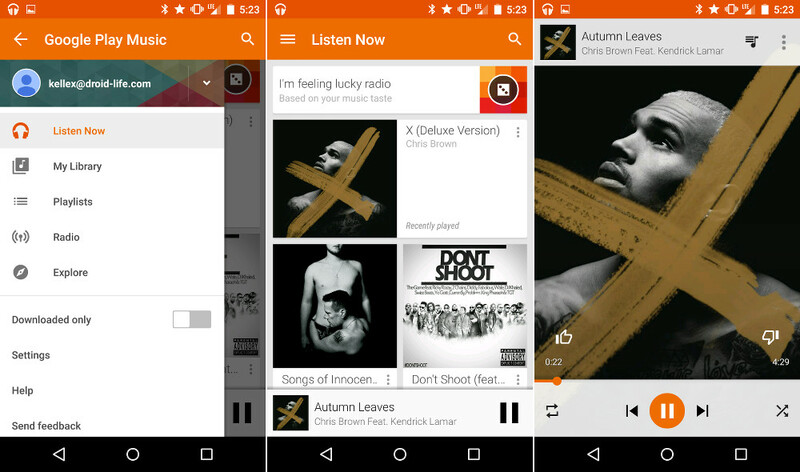 As you all noted, it’s not exactly the full Material Design makeover.